I had other commitments in June 1979, and this was my only day photographing that month. The location is Pontypool Road, in south-east Wales on the line between Newport and Hereford. Here we see 25224 working the 15:08 from Cardiff to Crewe, approaching Pontypool station and passing Pontypool Road South signal box, with its array of ex-GWR signalling. The purpose of the visit was to record the signals and signal box, for work had already started on resignalling the area. The land to the right, including lines and signal box were to be removed to make way for the New Inn bypass. Pontypool Road had once been a major railway centre in South Wales, with the cross-country line to Neath starting here, as well as lines up the Eastern Valleys and a large engine shed. When the station in the centre of the town closed, Pontypool Road was renamed Pontypool. 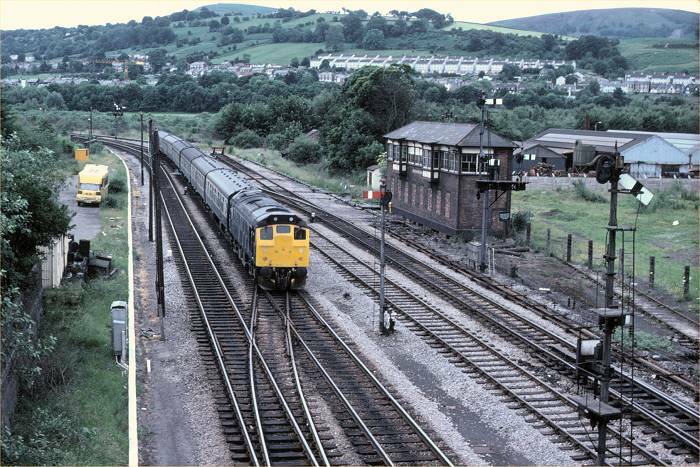 By 1979, all that remained of the railway infrastructure were some sidings, a connection to Panteg steelworks and a loop to join the Blaenavon line on the other side of the valley. Within a year, all (and the Blaenavon branch) had gone, although a new connection to the steelworks was added further down the main line. 25224 was typical motive power for the Cardiff-Crewe line in 1979, being one of Crewe's allocation of steam-heat 25s. Class 47s also appeared, mainly on Sundays. The service on the line at this time was fairly infrequent and slow.